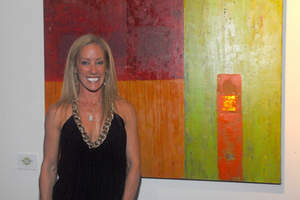 DALLAS, TX--(Marketwire - April 23, 2008) - Dallas artist and interior designer Laura Elia today announced the unveiling of her "Awake" series of inspirational paintings that are an expression of her discovery and exploration of Tibetan Buddhism. Elia began painting this series in 2006, after images began to flood her mind during meditation practices. "As I was meditating, beautiful images and dynamic hues gave me a feeling of vibrancy and increased energy," she says. "I wanted to share these images with people so I bought canvases and tried to re-create them on the canvas." As the co-owner of the Dallas-based interior design firm Artful Interiors, Elia is accustomed to bringing visual concepts to life and receiving accolades for her work. However, she was pleased that when at her first show she sold almost every painting in her initial "Awake" series, which ranges in price from $500 for a 20" x 20" piece to $3,325 for a 48" x 60" piece. The inspirations for Elia's art are the imagery and saturated colors found in traditional Tibetan Buddhist ritual objects, like thangkas (painted or embroidered Buddhist banners used in ceremonies or on altars) and mandalas (ritualistic geometric designs symbolic of the universe, used in Buddhism as an aid to meditation). Laden with shapes, vivid colors, textures, and symbolism, the oil and acrylic paintings are both visually appealing and spiritually meaningful. Each of Elia's works of art has one or more Tibetan prayers embedded within -- "...a humble request for compassion, courage, knowledge, or end to suffering," she says. "In the 'Awake' series, the canvas represents one's mind and the vibrant; the saturated colors represent our thoughts and emotions; and the layers of different textures can be interpreted as active thoughts constantly bombarding our minds, distracting us from the present moment," Elia explains. "The elements of the paintings often overlap like thoughts and experiences layered in our minds. Circles have a universal mystical protective significance: I've used them to represent our breath, or pranayama, which radiates from our inner core and ripples out to our existence and connects us to all beings." Ten percent of the proceeds from the sale of Elia's artwork are donated to The International Campaign for Tibet (www.savetibet.org). "Because of the nature of the materials I'm using and due to the fact that I practice Tibetan Buddhism, I feel the need to support The International Campaign for Tibet," Elia says. "This organization helps the people who are being oppressed by the Chinese government to preserve their natural way of life. When people purchase my artwork I want it to help them get in touch with their own compassion and kindness, and I want them to know that they will also be helping someone across the world." For more information or to view Elia's paintings, visit www.awakeart.net or call 214-906-0230.